Margaret Wheatley, the complexity theorist, explains how personal growth takes place: “You cannot change a living thing from the outside. You can only disturb it so it changes itself.” Leadership development then, is largely about how we learn and grow in response to the disturbances or stimuli that life offers us. These “disturbances” can come from many sources; teachers, role models, or the study of nature for example. We can all think of the big influences in our lives, and how they changed the way we think, feel or behave. 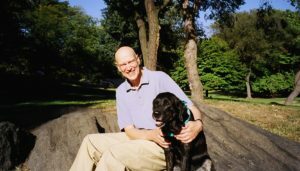 A profound set of lessons for me came from an unexpected source – my 14-year journey with a four-legged creature, my Black Labrador, Maisie. Maisie came to us from the Guiding Eyes For The Blind. At 18 months she had “failed” her final test, thus becoming what they euphemistically call a “release dog” and available for adoption. In due course we were approved, and excitedly welcomed her into our family. It soon became apparent why Maisie had failed at the final hurdle – she was just too eager to please. She would likely have led a blind person into all kinds of playful but inadvisable adventures. Certain memories become imprinted in our minds. So it was the day Maisie joined our family. I saw her for the first time when I got home from a day of teaching. We looked intently at each other, in a kind of mutual sizing up. She was a sleek, shiny, beautifully athletic canine youngster, exuding curiosity and eagerness. After this brief inspection her tail began to wag and she trotted towards me for our first greeting. She had decided I was okay. What struck me more than anything else that day were Maisie’s deep brown eyes; shining and youthful, but somehow also discerning and wise. From then on, Maisie and I walked the path of life together. We developed a growing bond built on time spent together in my home office, daily walks in the park, playing chase, often traveling together. We were seldom apart and learned to understand each other’s moods, needs and expectations. It is a truism that we are closest to those who have been our lifelong friends. Maisie knew me for 14 years, but I knew her through all her life stages – from her exuberant squirrel-chasing youth, through her more sedate middle age, to her faltering old age and eventual demise. Despite this mismatch in our life cycles, I would venture that Maisie knew me at least as well as I knew her, and in a number of respects even better. Many of my memories of my years with Maisie are purely sentimental. I have a scrapbook that I page through regularly, quietly savoring the special bond we shared. But beyond this nostalgia, this relationship revealed to me some important lessons about life and leadership. In the business world, we emphasize how important it is for companies and their leaders to be “transparent.” To clarify this buzzword we come up with sophisticated definitions of what this actually means, from the rules for “full disclosure” in financial statements to simple calls for honesty in our dealings with others. When this topic comes up in my seminars, I reflect on what I learned from Maisie and often ask how many attendees own a dog. Usually this is around 50%. Then I offer this advice, “If you want to understand what true transparency looks like, observe your dog.” I then ask the dog owners to describe to the rest of the group what they see in their dog’s behavior. What follows is a great discussion about the real meaning of transparency. Day in and day out Maisie revealed her mood or feelings without reservation — whether joy, fear, pain, hunger, playfulness or just the need for a walk. No pretenses, no vanity, no ulterior motives, no defensiveness, no fear of being judged; just plain honesty and most important of all, humility. I can’t think of a better transparency check list for business leaders. Logic tells us this is true. Yet how hard it is for us lofty humans to live in the here and now. We pride ourselves in our ability to interpret the past and contemplate the future, and in the process we too often forsake the present. It is always instructive to hear the stories of people who have been through a near death event. It jolts them into experiencing the rest of their lives in the present tense, and they tell us how transformative this has been. That lesson in dog training was a real epiphany. My attitude up to that point had been rather condescending, thinking that as a dog Maisie could only learn by rote; that belief in herself didn’t matter. I had forgotten the most important task of a leader – to help others overcome self-doubt and realize their best selves. The revelation was to see what a big difference encouraging the spirit makes, as much in the canine species as in the human one. I don’t think there is a more consequential attribute than enthusiasm. It literally changes our chemistry, drives us forward, helps us overcome hurdles, and inspires cooperation in others. My daily “dose” of enthusiasm came from Maisie. She responded to both small and big things with the same zest and joy – whether it was a car ride, a new toy or a visit from a friend. During our early morning walks in Central Park, she sniffed the air with expectation, played eagerly with other dogs, chased the ball with a joyful vigor and licked the hands of her favorite people. Seeing her in full flight was a wondrous, uplifting sight. Whatever she was doing, she was all in, fully committed. When I would get back to my office to start the work day, with Maisie resting at my feet, I was infused with positive energy. Everything felt brighter and more hopeful. Life was good. There is a message here for leaders everywhere: Pause to find joy in small things as well as large – the whole parade of life. No half measures. The magic of enthusiasm is that it’s infectious. As I was a regular traveler, this was a common occurrence. So to spare Maisie from prolonged disappointment I decided on a plot to conceal my travel. No packing, no suitcase, no visible signs of travel until the last minute. But something really interesting happened. Without any concrete evidence Maisie sensed my impending departures, and showed her disappointment. What was it? Did she pick up key words like “passport” or “tickets” or was it a subtle change in my nervous energy or scent? I never figured out what triggered this, but one way or another, Maisie got the message at an intuitive level. She was simply much better at interpreting me than I was her. The best leaders recognize the importance of effective communication, and that the key to this is the ability to listen well. But words are inefficient, and humans often use them to shield their real feelings. Maisie reminded me that the high art of listening is the ability to hear what is not being said, but nevertheless being felt. The gurus tell us that effective leadership is based on trust. This is undeniably true. But how do we gauge trust? My time with Maisie made me think of trust in new ways. In important respects we depended on each other; enriched each other’s lives. But clearly she was the more vulnerable partner – to mistreatment or neglect, for example. I realized that the ultimate test of trust is how we treat those who rely on us, but have no means of retaliation when we fail them. The abuse of power is the biggest breach of all. All this came into sharp and wrenching focus when Maisie reached the final stages of her life. Old age began to ravage her, and she struggled more and more. Under the watchful eye of our vet, we made sure she wasn’t suffering pain, and kept putting off the awful moment. We wanted to hold on to her. But her discomfort and distress increased, and her joy of life faded away. We knew the end was coming soon but needed a signal. On a sunny April day, I took Maisie out for a gentle walk. At a certain point she stumbled and glanced up at me. Those wise brown eyes conveyed a message, “I think it’s time.” Maisie trusted me to understand when her time was up, and to be with her when the end came. The vet was kind and understanding. Tears were okay as my wife, Laura, and I said farewell to our treasured friend. As I think about these lessons I am struck by the fact that they raise the basic question: are leaders born or are they made? I don’t mean to be glib, but I am convinced that the answer is both. Yes, we are all born with a unique set of leadership gifts, our genetic baseline if you like. But it is also true that we can improve on what we have inherited if we are open to it. This is far from a trivial conclusion. Apart from anything else, it stops us from giving ourselves the lazy answer that our leadership effectiveness is just a function of the genetic lottery. More important, it means that there are pathways to personal growth we can pursue. As each of us considers our own avenues of growth, we come back to Margaret Wheatley’s insight. We tend to think of leadership as being conferred by a formal appointment to a position of authority. But leadership development, she reminds us, must be self-generated. Our task is to search for the stimuli that will light the way. We enrich our insights when we turn our lens on a wider field. What can we learn from laborers, artists, scientists and adventurers? From our fellow creatures? To my surprise and delight, I found a number of rich, and sometimes humbling, insights about life and leadership from my cross-species relationship with Maisie. Written nearly two centuries ago, Carl von Clausewitz’s classic guide to military strategy, On War , remains essential reading for modern business strategists. 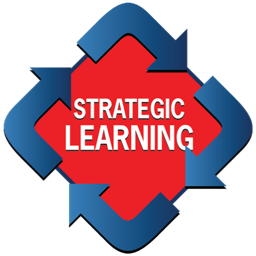 Yet for much of modern history the word “strategy” seldom appeared in the business vernacular. The concept, derived from the Greek strategia — a compound of stratos, meaning “army,” and agein, meaning “to lead” — was instead born in the military. The common term in business before the 1970s was “long-term planning” — the practice of forecasting numbers to map the future. Then business gurus began borrowing “strategy” — a much sexier term — from the military. But for most organizations, this was just a rebranding exercise for existing routines, not a change in behavior. And in many companies these sterile forecasting methods have remained essentially unchanged. In today’s turbulent marketplace this kind of ritualistic planning is no longer enough. Organizations must also have a winning strategy to achieve competitive advantage and the ability to renew that strategy as the environment shifts. That is precisely the challenge the military has faced through the ages as it contended contends with the changing terrain, chaotic elements, and unexpected opportunities of warfare. From this crucible the great military thinkers honed the fundamental principles of strategy, and few among those thinkers are quite so revered as von Clausewitz. 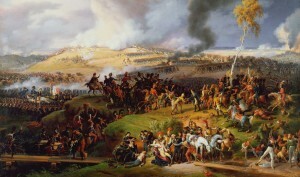 Clausewitz, a Prussian general who fought against Napoleon, quite literally wrote the book on war. Published in 1832, a year after his death, On War is regarded by military experts even today as the definitive study of warfare. His ideas remain widely taught in military schools, and are, more than ever, essential to the modern strategist. Strategy is frequently misunderstood and therefore misapplied. More than any other business discipline, it suffers from crippling confusion and over-complication. In fact, the essence of strategy is stunningly simple, and therein lies its power. Let’s start with the threshold question. Why do we need a strategy in the first place? Clausewitz gives us the answer. Strategy is the necessary response to the inescapable reality of limited resources. No entity, regardless of size, has unlimited resources. Strategy, therefore, is about making choices on how we will concentrate our limited resources to achieve competitive advantage. All else follows from there. The talent of the strategist is to identify the decisive point and to concentrate everything on it, removing forces from secondary fronts and ignoring lesser objectives. The decisive point: Here he refers to what I call the winning proposition — the central animating idea around which we must organize all our decisions and activities in order to outperform our competitors. Once we have identified this, it’s all about focus and determination. Remove: Every new thing we choose to do subtracts effort from everything else we do. Making choices therefore means deciding what we will not do. These subtractions are the toughest decisions of all, but ducking them can be fatal. The most dangerous choice of all is not choosing. Ignore: A winning strategy requires a disciplined mind and a steadfast character. No distractions; no sideshows. We must always keep the main thing the main thing. Clausewitz’s definition gives us the theoretical superstructure for thinking and acting strategically. All elaborations are subplots of this central theme. Strategy and planning are not the same thing. Tactics are the use of armed forces in a particular battle, while strategy is the doctrine of the use of individual battles for the purposes of war. Strategy is about picking the right battles. Tactics are about successfully executing those battles. Strategy is concerned with defining an overall purpose and priorities. It is holistic. It clarifies how the individual battles fit together and why they are being fought. Strategy’s key role is to define a winning proposition, a rallying call from which all decisions and activities will cascade. To be clear, planning is also important. But it is not a substitute for strategy. We don’t create a strategy with a plan. We execute it with a plan. For example, your budget should be the financial expression of your strategy, not the reverse. The right sequence is essential: strategy first, planning afterwards. Simplicity in planning fosters energy in execution. Strong determination in carrying through a simple idea is the surest route to success. The winning simplicity we seek, the simplicity of genius, is the result of intense mental engagement. A strategy must be distilled into the simplest language possible so that everyone in an organization can follow it. Complexity paralyzes. Simplicity empowers. Simplicity is not a short cut; it’s hard work — requiring the kind of intense mental engagement Clausewitz emphasizes. Some generals consider only unilateral action, whereas war consists of a continuous interaction of opposites … no strategy ever survives the first engagement with the enemy. One of the most common pitfalls amongst strategists is competitive neglect. We are susceptible to a false mental image that our competitors are standing still — that we are the only ones moving. This happens in particular when we have to play catch-up and close a gap in, say, customer service. In fact, competitors are running as fast as they can, so closing a gap means that we have to run even faster. Making choices means seeing the world through the eyes of our competitors. What would their most likely counter-moves be? How will we contend with these? Role-playing is a useful way to plot this out. Observe the chess master: no move is ad hoc. Success comes only from thinking several steps ahead. War is a trial of moral and physical forces by means of the latter. . . In the last analysis it is at moral, not physical strength that all military action is directed … Moral factors, then, are the ultimate determinants in war. War of course involves a contest of physical force. It is a blood sport. Clausewitz, however, emphasizes the definitive importance of “moral factors,” or what we think of as morale. He makes the blunt claim that once you have destroyed your enemy’s spirit — his will to fight — you have won the war. He notes that the armies that prevail most often are those that have the full-hearted support of their citizens back home. When that encouragement is lacking, self-doubt sets in and motivation is undermined. This lesson applies equally in the business world, and here we have great cause for concern. Only 30 percent of employees in the U.S., and 13 percent globally, feel engaged at work, according to a 2013 Gallup Survey. This morale deficit bears a dramatic cost. Companies in the top quartile for employee engagement saw 22 percent greater profitability, 10 percent higher customer ratings, 28 percent lower rates of theft, and 48 percent fewer safety incidents when compared with those in the bottom. We need a philosophy of strategy that contains the seeds of its constant rejuvenation — a way to chart strategy in an unstable environment. Organizations create their future through the strategies they pursue. In such high-stakes choice making, an ad hoc approach will not cut it. We must have a shared process inspired by the right thinking. In fast-changing conditions, static methods don’t work. An organization’s survival depends on the mastery of a dynamic process for generating ongoing renewal. Strategy, like any other discipline in the modern world, as Alvin Toffler reminds us, requires constant learning, unlearning, and relearning. This requires a shift of gears from strategy as planning to strategy as learning. Embedding this adaptive capability is, in the final analysis, the only route to a sustainable competitive advantage. Note: In composing this article I have drawn on the translations from von Clausewitz’s German text by both Michael Howard, the military historian, and the Boston Consulting Group.